We don't have any left handed Pole Kat heads, but we do have similar-weighted left handed heads at 450 grams that work great for conventional length "Heavy Putters" or for long "Chest Putters". This is a premium stainless steel putter combining classic design with new age ideas. The key feature is the alignment system which has a raised alignment bar with the sides painted red. With the putter resting on the ground at the center of your stance, if you see both red sides, you know your eyes are directly over the line of sight and you are more likely to hit a straight putt. If you only see one red side wall, then your head is not centered over the putter. 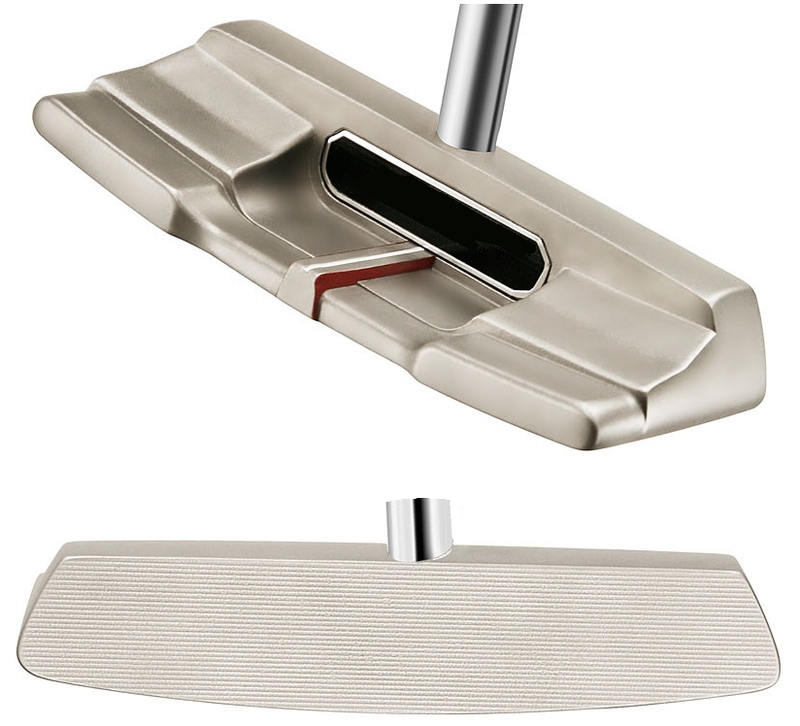 This head features a silver glass bead finish and the face has been CNC milled with horizontal micro-grooves giving the machined look of today's high end putters. The telescopic-shafted cost is the same as with the Pole Kat head which is normally $169 for a conventional-length putter, and $249 for chest length putters. If ordered before the end of April the cost is $199, plus an additional 10% discount if you order 3 or more clubs. If you want to order a putter with this head, you will see it as one of the "Putter Head Style" selections on our secure order page. Check the button that says, "Heavy Left Handed 450 Gram Putter Head"
Click here to order this Left Handed Heavy Putter on a conventional-length shaft. Click here to order a Chest Putter with this head. Use your BACK button to go back to the previous page.